New Apprehensive Films video blog is up! We talk about our top sellers, the Pollygrind Film Festival, Vault of Mysterious Information podcast and our retro VHS style promotions we're putting into our releases. The First Apprehensive Films Video Blog (VLOG). See all the news on Halloween Home Haunts, G-String Horror, Hardware Wars, Game of Survival, the 420 Friendly Comedy Special and more!!! 13 Terrifying Horror DVDs for only $99.95!! Shipping is free in the Lower 48 States (USA). This package is valued at more than $150.00 at regular retail price. You get all the titles below. Many are part of our limited, 500 unit editions, so order soon before they're no longer available!! Mystery DVD?!?! What could it be, who knows, but it will be horrific! THE FIRST TIME EVER RELEASED!!! 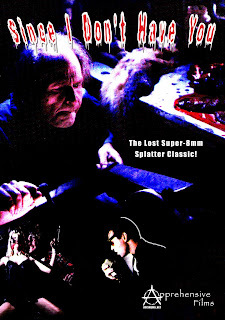 The Lost Super-8mm Splatter Classic from 1992!! Since I Don't Have You: Dewight has a problem shut away deep in his mind. Old Man Kavenaugh has a problem locked away in his decrepit shed behind his rural home. When Dewight's car breaks down on a lonely road near Kavenuagh's abode, the two have a chance encounter that spirals into an ever increasing bizarre, horrific and nightmarish journey. The thin line between reality and fantasy crumbles and problems that have been locked away for years break free from their chains in a shocking climax! Since I Don't Have You is a film that will stay with it's viewer long past it's welcome, you've been warned!! Three of the Most Extreme Asian Nature Run Amuck Horror Films! Calamity of Snakes, Centipede Horror and The Devil all for one low price of $24.95 at www.TheGrindHouse.Net Save 30% over buying each DVD individually!! A mesmerizing CSI-caliber quest for proof of life after death. 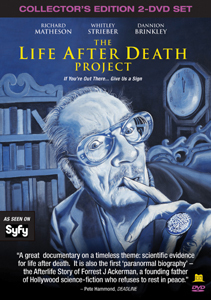 Four NY Times best-selling authors, three science professors and three mediums investigate astonishing evidence in the true case of "After Death Communication" (ADC) from Sci-Fi luminary Forrest J Ackerman. Forrest J Ackermann Tribute with Rick Baker and Ray Bradbury! Excerpt from the Sci-Fi Boys Documentary! Expanded Scientist Statement by Dr. John Allison! The Demise of the Ackermansion! Sci-Fi Museum of Seattle Showcases Visionaries and Futurists! This DVD is Signed by Cover Artist Eddie Julian!! Only 5 Available!! Comes Packaged in Slime Green DVD Case!! The most vile and notorious of all the nature run amuck movies, Centipede Horror is presented here uncut in all it's glory. This was shot in South East Asia using only real giant centipedes. Centipedes are highly venomous and they are crawling in and out of all kinds of places they don't belong in this truly one of a kind film. Widescreen, 90 minutes, In Cantonese with English Subtitles. The disc includes Scalped: A killer hunts and captures hikers in the woods to keep them as human pets in the basement. Written and Directed by Ben Miller. Special Features: Trailer for the shocking and disturbing short film Sublime Depravity.